Okay, so maybe you weren't actually born with flawless skin — but who has to know? This concealer offers a creamy, comfortable solution to help hide imperfections, minimize the look of flaws and blur the appearance of lines and wrinkles. Wear it alone or under foundation for a look that says, "I'm perfect in every way". I am very pale and have a few wrinkles around the eyes. This is a very neutral color and is not dry or cakey. I will definitely buy again. I am 67 and have dry skin and some wrinkles. I use this under my eyes and it really hides the darker colors there. I have used it on spots with great success too. It is on the verge of being a little drying, but you don't want wear creases, so I decided that is my compromise. I am very pleased with the Deep Tan concealer. It does look natural and blends well. Thanks Too Faced. 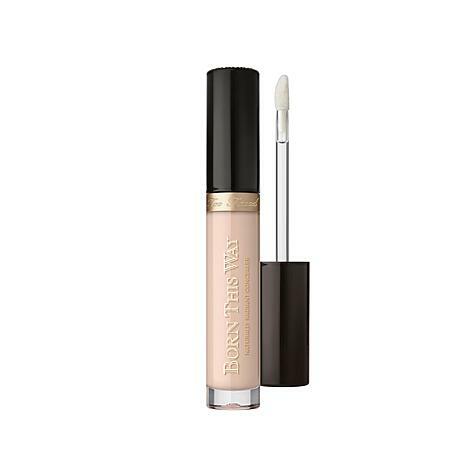 I just began using this concealer and am really happy i did,great product!! This concealer is great. Coverage is amazing. Doesn't settle into fine lines.